Viktor Yushchenko and Sumy Governor Volodymyr Shcherban signed a document expressing their intent to set up a single faction in the parliament. On January 9 the agreement on the formation of Viktor Yushchenko’s Our Ukraine bloc was signed at the foot of the monument to Mykhailo Hrushevsky. It would hardly serve any purpose to argue about the time or place or what made Mr. Yushchenko’s image-makers choose the site; why Hrushevsky’s and not some other statue? Probably it was because the place is symbolic as was supposed to be signing ceremony, although the effect was totally lost on the small crowd of citizens watching on. On the other hand, the site was convenient to reach for the interested parties and the audience at the Teacher’s House (once known as the Central Rada — Ed.) was right next door. Our Ukraine’s leader was late for the signing ceremony (the time had been made known well in advance). Temporarily free, the square was promptly occupied by second-rate politicians from the bloc parties, enthusiastically posing for photographers and television cameras, first in front of the monument and then around it. After the celebrities arrived the square was cleared. 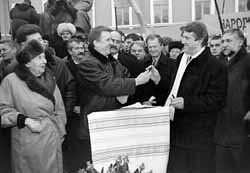 Just as Mr. Yushchenko was delivering Season’s Greetings in front of a battery of cameras, dwelling on the historical background of the event, a numerous “presidium” formed in the back, mostly people wishing to be seen on television, among them Volodymyr Yavorivsky, Mykola Porovsky, and other political figures of lesser renown showing great activity, hoping to get back into big-time political circulation under the auspices of the nation’s hopeful. Leaders of the parties that formed the bloc like Hennady Udovenko, Yuri Kostenko, and Viktor Pynzenyk looked more composed. Obviously for want of protocol arrangements, the signatories did not bother to take turns walking up — rather elbowing through the crowd — to affix their hands. Petro Poroshenko took his time fumbling in his pockets for a pen, so he found himself among the last to sign. The press took little interest in the order of signatures. Instead, the journalists were reading and passing on copies of a transcript of the December 13 telephone conversation between Oleksandr Omelchenko and Viktor Yushchenko. Through with the emotionally packed text (presumably a wiretap), the people of the fifth estate could not but act contrary to the scenario (whereby the signatories and the accompanying media were to be treated to Christmas kutia [boiled wheat or rice with honey, ground poppy seeds, and raisins]). Correctly assuming that the appearance of the transcript on the signing date was no coincidence, the media people wanted to know Mr. Yushchenko’s opinion. What the ex-premier had to say at the outset of what looked like another cassette scandal was not of special interest. Without doubt, the leader of Our Ukraine is learning to be a politician, so he had enough common sense not to declare right off that the whole thing was a sham. On the other hand, there was no one around to prompt him, for the bloc allies were just positioning themselves close to their leader. He said he was not going to comment and that those behind the whole thing ought to be ashamed of themselves. It was perhaps the only way out of the highly embarrassing situation. Indeed, under the circumstances his image had suffered a heavy blow in the public eye. The efforts of his publicity campaign headquarters had gone up in smoke, and now his team needed time to work out a new line of conduct, just in case further compromising information broke surface, concerning his relationships with other politicians. It all looked as though Viktor Yushchenko, regarded by some as the next leader of the nation, had just received an opportunity to experience what his supposed godfather Leonid Kuchma had the previous year. As was to be expected, the gap left by Major Melnychenko was filled with quite enough exports on wiretapping and selectively publicizing private conversations between well-known politicians. What can the leader of Our Ukraine offer to counter this with? A generally recognized method to combat provocation is for a politician to keep as much of what he does in the open as he can. If whatever he does or says is public knowledge and everybody can understand it, the ground is cut out from under the feet of those plotting and scheming against him. It is highly unlikely that Yushchenko’s campaigning architect are unaware of this, yet they do not want — or maybe cannot — put the right words in his mouth, to begin with, the underlying principles of Our Ukraine. Mr. Yushchenko’s sincere face and honest eyes are not enough to explain precisely what unites Petro Poroshenko’s Solidarity with Rukh with Governor Volodymyr Shcherban’s Liberals with Slava Stetsko’s nationalists. Likewise, the bloc’s roster is being drawn up and candidacies in the majority constituencies agreed upon in an atmosphere of vague secrecy. Why not announce the first five names when signing the bloc agreement? Why should Mr. Yushchenko avoid giving straight answers to straight questions during an impromptu press conference kept so indecorously short? References to an interparty convention that will, allegedly dot the i’s and cross the t’s just do not hold water. Ceremoniously signing a bloc agreement means that everything has been settled among the parties concerned. Otherwise the gathering at the monument to the first president of the first Ukrainian parliament makes no sense. What can one say by way of a caption under a photo of the politicians posing in front of the Hrushevsky statue, considering that no one knows exactly who is in Yushchenko’s bloc?